(Poker dice were first made in 1881 by the Celluloid Co., NYC, according to Kevin Cook, holder of the world's largest dice collection. I have a regular dice set w/ original box from the Celluloid Co. [seen in the last picture below]. The first poker dice patent was filed in 1881. Kevin made me aware of these links to that patent: click, click and click [note: not all browsers show it so well].) Also these other poker dice links:, click, click click, click, . This is FOR SALE, though -- set of five contemporary poker dice: each side 5/8" -- fine condition -- $4.50 plus $3 postage. Here are two boxed sets of dice. 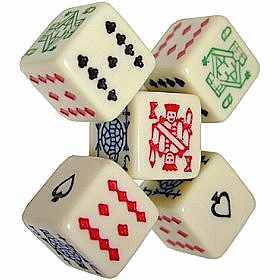 The five dice on the top (which could be used as poker dice) are celluloid, not ivory. 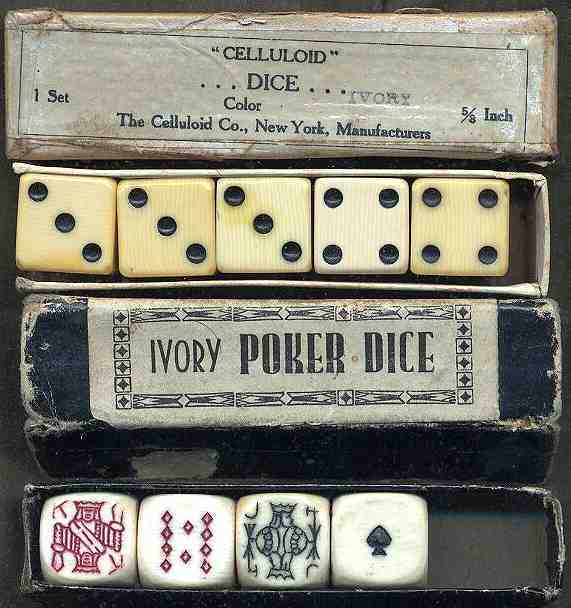 Like many dice manufacturers, the box proclaimed an ivory "color." ...... ........ ......... The 4 dice on the bottom of the picture (one die is missing) are the the first ivory poker dice I have ever seen. Though you can't see it in this scan, the dice have the typical ivory grain cross-hatching. See here for more about the differences between bone, ivory and celluloid. I just (April 2004) acquired this boxed set for about $100 on eBay. 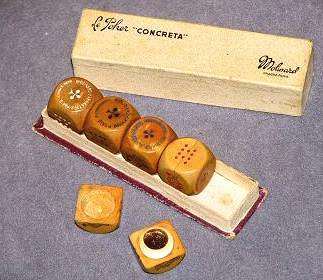 The seller described it as, " 5 Molinard wooden poker dice in original box- Le Poker "CONCRETA". Each die unscrews and has solid perfume inside. Brought back from Paris in the late 1940's. Some of the solid perfume and the pleasant aroma still is intact. A real collectible!" Using the interenet, I found out that (1) "concreta" means "it realizes" in Italian, I thought. I am now told "concreta" means "concrete" -- thus "solid," so solid perfume; and (2) "concreta" is a solid perfume line today! More information at this eBay guide. It says, in part, : " In 1849, a chemist named Molinard Jeune concocted excellent perfumed waters in the secrecy of his laboratory which he then sold from a small boutique in the center of town. The reputation of Molinard's perfumes grew and became established with the creation in 1921 of Habanita, a perfume that to the day remains a great classic. CONCRETA: "'The genuine wax of the flowers, used directly as a perfume, Just a touch behind the ear, in the hair, on the eyebrows, on the linings of your coat, quite enough to be perfumed. ', states a vintage Concreta advertisement. In 1925, Molinard created the first solid perfumes, called concreta. These solids were the genuine wax from the flowers. This alcohol free formula, is a very guarded secret and has even been patented by Molinard. It is more concentrated than any other perfume, and will last a lot longer as well. Even vintage concreta still retains a strong scent." 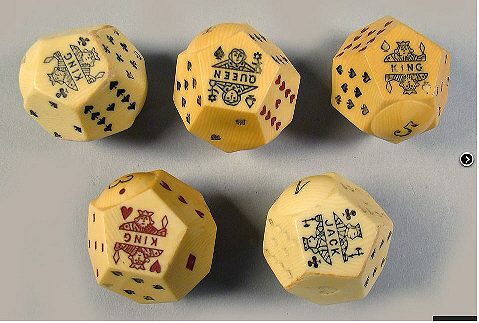 Celluloid poker dice. Not mine. Note the bulges. They are numbered 1 to 5. Went for $200 at auction April 2012. Size not given.